Raquel really digs it when I make special meals for her. They aren't really special in terms of ingredients, just the way I present them to her. I don't have time to make fancy food. Goldurn, some times I don't even have time to make a well-rounded lunch! Thank goodness I always have leftovers to work with. 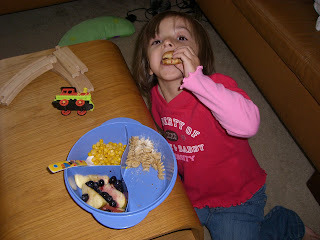 This lunch is just defrosted frozen blueberries (no sugar added) with fuji apple slices, PBnJ on toasted hotdog bun with rainbow sprinkles on the outter edge, rotelle with butter and parmesan and a little canned corn with butter. This is as fun for me as it is enticing for her (maybe even a bit more). I don't think my husband likes that I blog as often as I do but it does make me happy and I like keeping my family and friends updated. Thanks for reading! Hi Maxine! She's so pretty! Thank you for updating us. Your food presentations to Raquel are awesome! I really like the PBJ and the sprinkles! 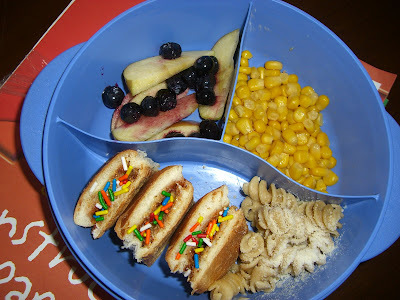 I am sure that is the best way to get kids to eat well :) Glad you had the day off. I don't think my tough times are any tougher than any other mother. I just thank God I didn't have twins. Thats a good idea to keep raquel entertained and nourished. 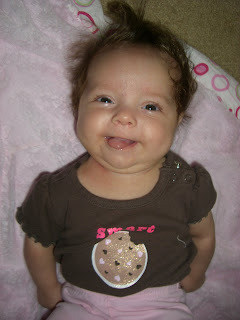 I'm sorry youre having a tough time-- but it seems like you have a happy baby always smiling really big! If you ever need help Brianne recently mentioned she would be more than willing to babysit or help you do any errands. check out her blog if you want- the wyatts one. a)not having money to make those nice lunch for your kids. b)Not having water or electricity to run your washer and dryer. c)Your kids are sick and you have no health insurance. d)You never see your husband because he is always working and when he is home he is abusive. I can go on and on about hard times. WE ARE SO LUCKY TO HAVE WHAT WE HAVE. I loved jose's comment! So true. I will be looking forward to thinking positively. Dude. What did Shaniqua say????? Her name alone peaked my interest! Wish I would have had them as a kid.